bgroup’s A Short Lived Alteration of an Existing Situation – voted very highly by the audience but didn’t make it through to finals. Nothing in contemporary dance is more guaranteed to provoke controversy than the Place Prize, now returning for its fifth edition, organised by the excellent team at The Place and sponsored – as always – with a remarkable (and impressive) light touch by the people at Bloomberg; they seem to know that a major part of good corporate social responsibility is finding a winning artistic cause with great people running it and just giving them the wherewithal to get on and do it with no further strings attached. 208 choreographers applied to compete and were subject to a rigorous selection process that whittled the field down to just 16. This elite group were given the funds, space and support to turn their concepts into productions to be performed twice at The Place, once in a preview trial run and then in one of four semi-finals. The mathematicians reading this will have worked out that the odds of making the semi-finals were 13-1, already a major achievement, meaning that this was genuinely rather more than just the first round. Controversy begins with the very thought of choreographers competing in a sporting contest for money being upsetting to some. Then there is the perennial argument about the content of the work in relation to the “for dance” rule in the title, especially when some performances contain little in the way of conventional dance. Topping all other things to be concerned about is always the choice of which four works make the final and have a shout for a share of the £35K prize. One is chosen by the audience members who are invited to give each work a star rating on a scale of 1 to 5 at the end of each semi-final, a matter that is clearly influenced by the tactical voting of friends and family connected to the artists; and three are selected by a panel of judges. In the past, this panel itself has been the cause of some angst, especially in years when the balance appeared skewed to non-dance people. The quintet of judges for this year’s semi-finals was Roberto Casarotto (Director of Dance at the Venice Festival), Sarah Crompton (Arts Editor in Chief – and regular dance critic – at The Daily Telegraph) plus three artistic directors: Jonzi D (Breakin’ Convention), Siobhan Davies and Stine Nilsen (Candoco Dance Company); and their chairman was the Director of Theatre and Artist Development at The Place, Eddie Nixon. Whatever anyone thought of the panel’s decisions in 2012, more of which later, their collective dance expertise is unimpeachable. This year’s cohort of semi-finalists was strong on ingenuity but perhaps not so successful – with a few honourable exceptions – at delivery. The emphasis on technique-based dance was comparatively strong (against recollections of previous editions) and the use of spoken text by performers was evident in several pieces (3 of the 4 works put through to the final employ live speech). Perhaps the strongest overview was that the 16 pieces represented as broad a spectrum in the diversity of modern dance theatre as it would seem possible to have and that in itself is a major achievement of the selection process. Eva Recacha’s The Wishing Well. In terms of innovation we enjoyed Nina Kov’s Copter where the choreographer danced with a remote-controlled model helicopter (in fact, to be strictly accurate, two of them) brilliantly piloted off-stage by Jack Bishop to the extent that he gave this little “Budgie” a personality such that it seemed a genuine danced duet, although there was never more than one person on stage. Robbie Synge’s Settlement would have appealed to any stray structural engineers finding themselves in the audience as his two human performers (Robin Dingemans & Erik Nevin) partnered three large panels of MDF (medium-density fibreboard to the unitiated), balancing them against each other to make transient structures. It was an interesting exercise in shape, form and space, not to mention challenging the strength and timing of the two dancers. Mamoru Iriguchi relied heavily on technology to create his One Man Show which took the breach of the fourth wall into a new dimension by creating an on-stage relationship of thoughts between the performer and four imagined members of his audience represented by “living” panels on the stage. Iriguchi was personally responsible for the slick interactions of his live performance with his own lighting, set and digital projections, although it seemed to me that not everything worked quite as well as it could have done on the semi-final night. In The Devil’s Mischief, Neil Paris had his two dancers performing within a field of 86 white, conical dunce hats which appeared to project through the dance floor like the tips of sharpened pencils, but the fact that I counted and double-counted them all perhaps says something about the lack of arresting capability in the performance itself. Another work where the imagery outperformed the movement quality was in Ben Ash’s polemical Execute Now, for the Dog Kennel Hill Project. Ash and two others (Luke Birch and Matthew Morris) – in an eclectic selection of costumes – conducted a laboratory experiment in the pendulum effects of swinging sandbags against a soundtrack of repeated soundbites railing against the destructive scythe of global economics. It had a strong sense of mood and power at the opening but descended into a monotony of predictability as the movement was almost exclusively governed by the need to control the swinging pendulums. I had a similar sense of a good idea that needed better delivery in Seke Chimutengwende’s The Time Travel Project. The choreographer fronted his own work as if the theatre had been transformed into a lecture hall, and he was a modern-day adventurer engagingly narrating a story of travelling back in time and bringing ideas of how dance had developed from performances he had glimpsed on three such journeys ranging from 2042 to 2501. Like so many other pieces in the semi-finals, it was funny and contained the origins of a fascinating concept, but it could have been represented more interestingly in the danced content. Three strong pieces of dance theatre came in the first semi-final. A self-danced solo by Moreno Solinas had a bittersweet edge in exploring the Life is A Carnival theme of a dancer’s capsule biography. Solinas exploited his own roots in salsa and Latin dancing to give an amusing, intimate portrayal, in which he revealed a pleasing singing voice and a whole lot more. Tony Adigun’s The Lake was easily my favourite work of the semi-finals. It was a moving account of a child’s death, portrayed with an immense depth of feeling by the largest ensemble in the competition; visually arresting, it was cleverly set to a soundtrack that tugged at the sentimentality of the clouded narrative, which remained compellingly on the edge of mystery. I felt that there was some serious and unexplained depth to this work that held a great meaning to the choreographer and performers. What struck me most of all was that here was a choreographer shifting genres and stretching his reach as a dancemaker. Riccardo Buscarini’s Athletes was also an absorbing spectacle unlike any of his work that I have previously seen. His three dancers (Harriet Bone, Karolina Kraczkowska and Victoria Hoyland) were alien white beings, dressed in what my dancing daughter calls a “onesie”, a unitard covering each dancer from head to toe, with the bonus of a superimposed spinal extremity. They moved sinuously and very slowly with a peculiar asexual eroticism although interrupted by the interlude of a supercharged and passionate long kiss between one pair. Buscarini’s work is always stylish and theatrical and this did not disappoint on either count. Buscarini had already been a Place Prize Finalist in 2011 (jointly with Antonio de la Fe) as had Eva Recacha who got the fourth semi-final off to a jolting start with The Wishing Well, a solo for the charismatic and ebullient Martha Pasakopoulou performing within the confines of a mat for an artistic gymnast’s Floor Exercise while repeating sequences of miming, shouting and dancing juxtaposed with a soundtrack of spoken text, which included a softly-sung a cappella version of La Macarena that stayed with me all the way home. Alongside Adigun’s The Lake, the most complete work in terms of narrative structure with clearly delineated movements that represented a beginning, a middle and an end was Rick Nodine’s homage to his adolescent years as a “Deadhead” following the Grateful Dead (and, in particular, its front man, Jerry Garcia), entitled Dead Gig. This piece reminded me of Simon Ellis’s excellent finalist work in tribute to Gertrud Bodenwieser (back in 2008), especially in terms of its mature, rounded and coherent structure but also with a similar richness of development that I suspect has been many years in gestation: a factor that gave it an obvious edge over many of the other works. 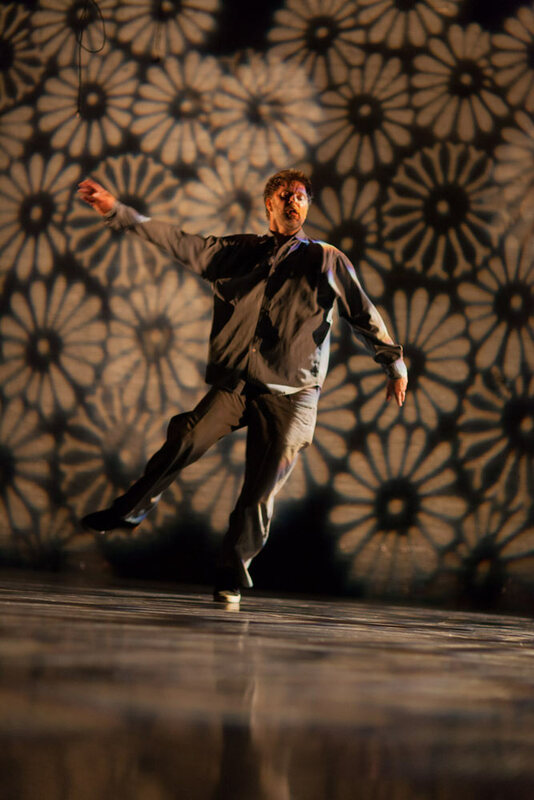 Darren Ellis’s rich experience as a performer also shone through his Revolver, an unremitting, relentless exercise in counting, timing and concentration by the two superb dancers (Hannah Kidd and Joanna Wenger) while Ellis himself played guitar onstage with The Turbulent Eddies. Though I was never remotely a “Deadhead”, bring back Garcia and Co is all I can say. This was music (enhanced by strobe lighting) of which migraines are made. Pure dance of one kind or another accounted for the remaining four works, three of which were duets. The one that wasn’t for a pair was Joe Moran’s Obverse, an abstract piece of pure dance for an excellent trio of dancers (Marina Collard, Wayne Parsons and Hilary Stainsby) that was like a sorbet cleansing the palate with its composite score from Scarlatti, Handel, Beethoven and others. The problem was that it had the dance equivalent of the graveyard slot, coming very first of the 16 works: not the right time for a sorbet, however refreshing it might be, and the simplicity of Obverse paled into the background as more powerful works came and went over subsequent nights. It is a great shame because I could see resonances with the lyrical, musical movement of Sue Davies and Richard Alston in Moran’s work; I wish we could have had a reprise of this one at the end. Jon Goddard and Gemma Nixon performed their own work entitled Third, which gave us a clear essay for some remarkable dancing in an abstract piece that seemed to have something to do with arctic exploration (or at the very least to take place in some frozen wasteland). Their duet featured the impressive downward projection lighting effects typical of Michael Hulls’ work. If there were a separate prize for the best dancing then Goddard and Nixon would have been high up anyone’s list, although I fear that the straight male-led relationship of the duet may have seemed too conventional for this audience. Irrespective of its setting, I found it to be an absorbing, flowing duet that summarised a fracturing relationship under strain from either emotional or environmental pressures (or probably both). The remaining two duets were the audience’s favourites: the only two pieces to score an average of 4 or more and separated for the final by just 0.1 in the final analysis, with Ben Wright’s bgroup just losing out. His A Short Lived Alteration of an Existing Situation was danced to Rachmaninov’s Prelude in B Minor, played live with the pianist (John Byrn) cloaked in darkness at the rear of the stage. It was a powerful piece danced enthusiastically and with strong emotion by Sam Denton and Lise Manavit. Guy Hoare’s lighting design was a major factor in its success (Hoare also did the lighting design for Execute Now). However, it was ultimately a decisive factor that Wright’s piece lost out to another duo as the audience’s favourite. h2dance’s simply-named Duet is a collaborative work made and danced by Hanna Gilligren and Heidi Rustgaard, which dissects a relationship and the unseen third party counselling in both spoken text and movement. 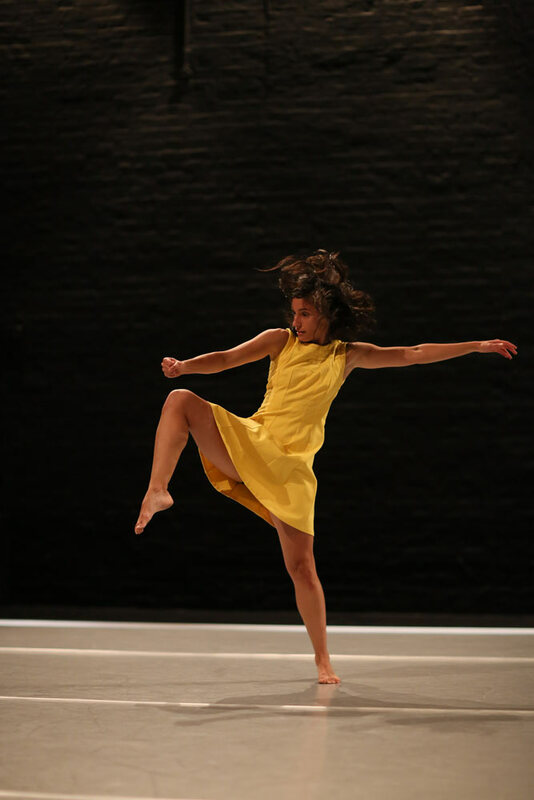 It is witty, and comic dance theatre traditionally does well in this event (think, for example, Luca Silvestrini’s B for Body and the last Place Prize winner, Lost Dog’s It Needs Horses) and the dynamic between Hanna and Heidi is priceless. It well deserved a place in the final and – whatever the judges think of it (and the Panel will change for the final) – it seems an obvious favourite to pick up a few of the nightly audience awards. There was an unusually lengthy delay in the announcement of the judges’ picks for the Final, which suggests some robust discussion, but not long before midnight, Eddie Nixon announced that they had selected Eva Recacha’s The Wishing Well, Rick Nodine’s Dead Gig and Riccardo Buscarini’s Athletes to join h2dance’s Duet in the series of performances for the Final to be held next April. Each of the works put into the final had significant merit and they offer an interestingly diverse programme, although only seven performers will be engaged across the four pieces (2 of which are solos). Personally, I felt that there were 7 or 8 that would have been worthy of the Final and the only disappointment for me was that the larger-scale work of Adigun was not included, but I hope that it – like some others from this semi-final – gains a performance life of its own. Apart from h2dance, the judges’ choices were placed 6th (Nodine), 9th (Recacha) and 12th (Buscarini) in the audience vote which just goes to show that populism doesn’t necessarily count for much. The alternative final of the top 4 pieces from the nightly votes would have been bgroup, Tony Adigun and either Seke Chimutengwende or Darren Ellis after counting fractions of votes. However, since I heard evidence of friends and family doctoring their votes to improve the chances of their supported choreographer, I will always be happy to bow to the judges over the bias of the audience in this event. Most people speaking to me in the aftermath of the voting announcement had some concern about the decision and I find it uplifting to have such passionate debate about the pros and cons of different approaches to modern dance. Although I much appreciated Martha Pasakopoulou’s endearing and absorbing solo performance, the only finalist that would not have been on my list of potentials was Recacha’s The Wishing Well but that’s probably because I still can’t get La Macarena out of my head!